Spray baking sheet with non-stick cooking spray. Preheat oven to 400. Mix the first four ingredients together, set aside. Pour 1/2 cup buttermilk in a bowl, set aside. Pour 1 cup of bread crumbs in a bowl, set aside. 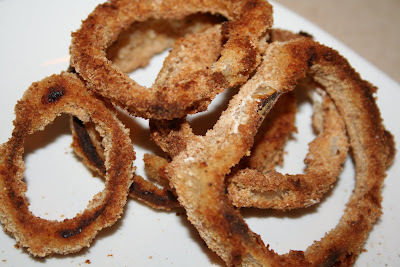 Dip sliced onion rings into flour, then buttermilk, then bread crumbs and then set on baking sheet. Bake 25-30 minutes turning once. 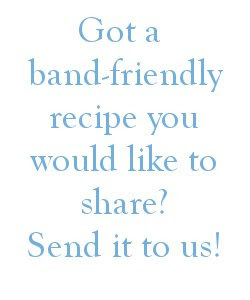 Makes alot...about 8 bandsters portions. For about 1/4 of an onion, there are 95 calories and 3.4 grams of protein. I'm trying this w/ eggplant right now. Let ya know how it turns out! yumm... I might have to try that too!